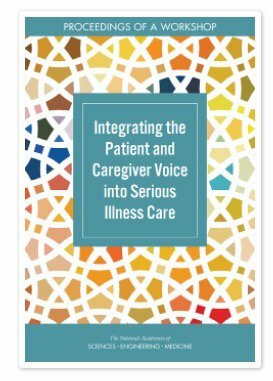 Recognizing the need to thoughtfully consider and address the challenges and opportunities to improve care quality and value for people of all ages facing serious illness, the Roundtable on Quality Care for People with Serious Illness of the National Academies of Sciences, Engineering, and Medicine held a public workshop entitled Integrating the Patient and Caregiver Voice into Serious Illness Care, on December 15, 2016, in Washington, DC. This workshop was the first in a series planned by the roundtable, and was designed specifically to bring together diverse personal perspectives and experiences about priorities and values that are important to patients and families coping with serious illness, and to consider solutions that support integration of these priorities and values in practice. The group recently released a publication summarizing the presentations and discussions from the workshop. Click here to download it today on PDF or to pre-order a paperback version.